Do what you can to recreate the theatrical experience for this one. Roman epics should be B-I-G.
On the inevitable comparison scale of Roman epics, where "Spartacus" and "Ben-Hur" (both 1926 and 1959) are 10s and that debacle of a "Cleopatra" miniseries from last year is a zero, "Gladiator" is about a five. But it's a spectacularly handsome, relatively complex, and confidently directed five. A stylish $100 million crowd-pleaser, it recreates the civilization of 180 A.D. in engrossing detail, from the huge, well-appointed sets to the CGI-rendered aerial shots of ancient Rome and the Colosseum -- which plays a pivotal role in the story. But in addition to an assiduous production designer with carte blanche, every Roman epic needs an imposing, broad-shouldered hero. Therefore, enter Russell Crowe as a betrayed imperial general, sold into slavery as a gladiator, who fights his way back to Rome to avenge himself upon the devious new emperor that double-crossed him and murdered his family. "Gladiator" opens with a humongous and bloody battle, built on the "Braveheart" template except that we're meant to cheer for the conquerors -- Romans invading Germania under the command of the great war hero Maximus (Crowe). A humble champion who wants only to return "to home, family and farm" after securing the empire's northern border, Maximus is instead chosen by an ailing emperor (Richard Harris) to succeed him to the throne, in place of Commodus (Joaquin Phoenix), his immoral and power-mad son. In true Roman drama tradition, Commodus then offs his father and orders Maximus and his family slain as well. But Maximus escapes, only to be captured by slave traders and sold to a gladiator trainer (the late Oliver Reed) in a desert province, where his battlefield expertise is the only thing that keeps him alive in a "sport" where "two men enter, one man leaves" is meant literally. Known as The Spaniard in the arena, he soon becomes famous enough to return to Rome and fight in front of Commodus in the Colosseum, where he reveals his identity and vows revenge. While "Gladiator" is nothing if not stimulating and richly visual, director Ridley Scott's sense of grandeur is inconsistent, and he often over-reaches in his attempts to modernize the storytelling for MTV audiences. The action is turned up a notch (Maximus fights not only other gladiators but also tigers -- at the same time), and so are the sound effects (flying arrows sound like more like missiles). Unfortunately, as an indirect result the movie builds itself into a crescendo that can only be resolved with an absurdly implausible showdown finale tantamount to Spartacus decrucifying himself in a burst of testosterone and defeating the Romans after all. 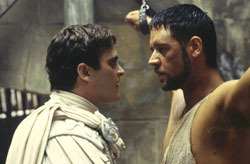 But even at its low points, "Gladiator" has one important thing going for it: Russell Crowe. Having proven himself a powerful and versatile actor in "L.A. Confidential" and his Oscar-nominated performance in "The Insider," here his intensity provides a stoic and undeniably heroic presence. His potent gaze and his calm, resonant voice have masculinity and strength to spare. He also looks dramatically valiant and virile in all that armor. Scott chose well for the rest of his cast, too. Phoenix is a unusual but apt pick to play Commodus' weasely, vengeful and ambitious egomania -- although the poor guy got screwed in the dialogue department and after a while just sounds whiny and petty instead of ruthless and malevolent. Connie Nielsen ("Mission to Mars") is regal and intelligent as the emperor's sister (and Maximus' one-time lover), who works clandestinely with a once-powerful senator (the ideally-cast Derek Jacobi), hoping to wrest power from her despotic brother and restore Rome to its republican roots. Reed (who passed away during filming) and Djimon Hounsou ("Amistad"), playing a fellow gladiator-slave, are under-utilized but no less impressive. Given a less ridiculous ending, a little more dramatic integrity, a little less box-office ambition and a slightly more frugal editor (the 150 minute run-time could have easily been 130), this entertaining but aggravating popcorn flick might have rivaled its legendary genre predecessors. It certainly has all the character, scope and scale required. But I guess they just don't make them like they used to.